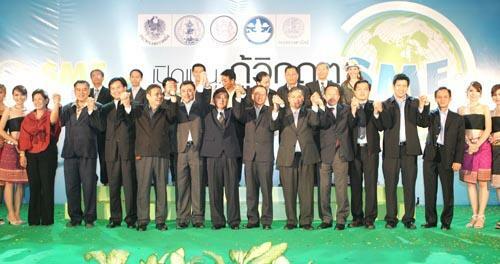 Mr. Phongpanu Svetarundra, Chairman of the Board of Directors of Small and Medium Enterprise Development Bank of Thailand (SME Bank), presided over the opening ceremony of the ?? ?Help SMEs Tackling Economic Crisis? ?� at Khon Khaen Province to promote the financial liquidity of tourism business with special interest rates, in which Mr. Anukun Tangkananukunchai, Vice Governor of Khon Khaen Province and government agencies, also joined the ceremony, at Grand Orchid Ballroom, Pullman Khon Kaen Racha Orchid Hotel, Khon Kaen Province, June 27 2009.